This thread: All things enTropy. Please keep discussions to the enTropy armor. the skills and animations were disturbingly awesome, a bit creepy in a whole new level, and kinda graphic, IMO, expecially "blood womb" skill, that one wins the prize of "I didn't want to sleep today, anyway". I think you guys had really outdone yourselves with that class. I really like the animations. They are much darker than any other class in DF, and have a wonderfully polished look. This class is pretty much the class that you can use to see your enemy slowly and painfully Rot to death. With the powerful DOT that this thing have i really a worth it. But the problem is i can't seem to understand how to use this class actually[&:]. Also is it just me or this class damage output is really low? The class is more defense-focused rather than offense, if I remember right. If that is the case, then that should account for why you think the class' damage output is rather low. The only flaw keeping enTropy from being the most reliable defensive Class out there is its inability to regenerate Mana. Otherwise, it has everything a defensive Class needs and more. A nigh irresistable Stunning Skill with a short cooldown, the most powerful Healing Skill in the game, a -80% Boost debuff- those are really all it needs to shut down an opponent. Not to mention that it is actually kind of unique in regards to defensive Classes. Most of its contemporary Classes use buffs to M/P/M Defense or debuffs to Bonus in order to divert a fair amount of damage (DragonLord, Frost Moglin Armor, Necromancer, Paladin, Pyromancer, etc. ), but enTropy... sort of relies on alternating between healing, nerfing damage, Stunning, and just plain muscling through damage. And you know what? It still works. Every. Single. Time. @above: Indeed, the Class leans more toward defense than offensive. It feels offensively stronger than Pyromancer, though, so it has been seen as a sort of mix between offensive and defensive power among Dragon Coin Classes as of late. Now I've never used this class, but I've seen it being used, and I've looked at the skills of it, and it looks awesome. I personally think it could also be used as a Chaosweaver type class, until the actual one is released. Great offense, defense, definitely one of the stronger classes in game. I have the armor, and while I love the skills, the only issue I have with the armor is that it is not customizable with other parts. I was hoping for a human-entropy hybrid. Faerdin: Honestly, there is no way to actually defeat an enTropy in a long fight where the boss doesn't hit very hard. I can say that from first-hand experience; with a little aid from my dragon, I managed to take down the Bugged Bone Fire. Considering that it had about 250k HP and I still had mana at the end, the sheer longevity with the health makes up for it. 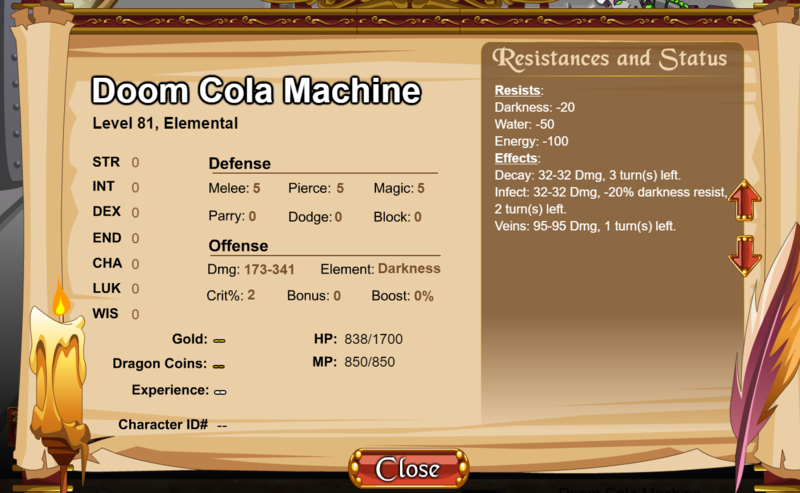 The reason why it's so strong in cases is when you have a healing weapon (Frostval) equipped. Because you have an 11 hit and a 9 hit skill, you can do loads of damage and heal at the same time. Because Rotting Touch is only 4(!) MP, it leads to a very easy way to beat any long boss-fight with over 50k (which is not many); just spam Attack with Touch when you can and then towards the end when you still have lots of mana, go all out. 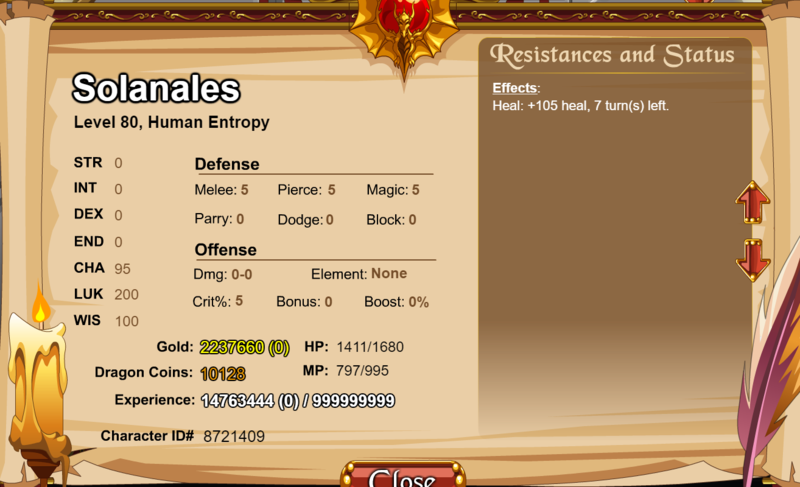 Basically, I find enTropy a beautiful, fun, powerful class. It's really very fun. I've been considering buying it for a while... it's always been an interesting class to me. My only beef with them is how awkward they look when simply running around. The only thing I've never liked about enTropy was the fact that you can't see your armor. Now, I understand why... and I'm over it, but it still bugs me a bit. I'll most likely buy it in the future, but I'll probably wait till Chaosweaver comes out. I've had the armour since it was released and I've never thought twice about getting it. It's such a unique class in the way it plays and it's glorious when it does it. Debuffs and DoTs have always been my favourite form of combat, so combine that with brilliant animation; it's a done deal. The few gripes I have are the lack of the Tropy combo (we got a reason why it couldn't be done, but I still want it T_T) and that Plague was never fixed. Even changing the text to say what actually happens would do, but they are very minor compared to the fun times I've had with the class. I know what you mean by the odd running animation, but you do get used to it. It doesn't bother me anymore even though I will always see it. Oh i see so it's more defense based that explain why it's weak :V still though i can't complain much since this class has brought from level 70 to 75 really fast. I can't really say anything since I don't have the armor, but from what I have seen, the animations are monstrous. Kinda reminds me of Zappa from Guilty Gear. The class really is one of those 'multi DOT them and then block til the enemy drops' types of classes. enTropy is a brilliantly strategic class. As opposed to, well, all other DC classes, enTropy has various effective strategies against all sorts of enemies. With all of it's ability to debuff the opponent and break them down slowly, I think that enTropy is one of the most versatile and most potentially powerful armors in-game. Although I rarely use it (not terribly good at farming), enTropy is my go-to armor for any difficult bosses and enemies. In terms of offence, I think the class is great against the harder bosses as it would have better long-term damage output than probably all the non-DC classes (including Soulweaver and the like) and Pyromancer (in some cases, Kathool Adept). This is assuming the boss doesn't resist Darkness and that you have a good darkness weapon. However, enTropy is bad against multiple opponents, makes long quests even longer and could run out of MP during these quests. Against bosses which resist darkness, the damage isn't as high though still comparable to (and perhaps greater than) Soulweaver's. Great armor! good looks, good for farming, good for bosses and cool animations. In my opinion the class looks great and has the power to destroy most enemies. Defensively it can heal and stun enemies. 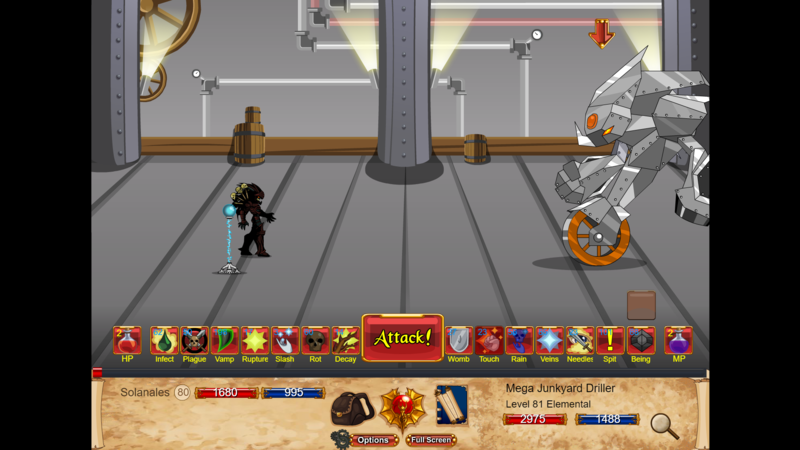 Offensively it lowers the enemies attack Combined with a high mana and crit this class easily turns into a powerhouse. Infection used to be "33% dmg over 3 turns a DOT" and is now a giant description that can't even be seen on-screen. Volatile Veins's DoT is pretty lit (using only Light of Wisdom, no other equipment). According to Verly, this was done by Ash, though I think it was implemented only recently. Even if it's not a bug, though, it's going to be shuffled to the bottom of the to-do list, so revamped enTropy's probably going to stay in the game for a while at the very least. It reminds me of KAA with the scaling damage boost and prohibitively high mana costs (seriously, I don't think 100 WIS is going to cut it). I wonder if the mana costs also scale per level? At least KAA had a mana heal, small as it may have been. So is it worth 1800 Dragon Coins? If you bought the DoomKnight package, why not? You're pretty much drowning in DCs, so you might as well grab it. If you didn't, I would rank enTropy at the bottom of the DC classes now (Pyro > AE > IR > KAA > eT, 100% personal opinion). The damage is pretty good, but the high mana costs make even a 200 WIS build unfeasible for longer encounters. The heal has a 19 (IIRC) turn cooldown now and eats almost 200 mana, not to mention taking forever to take effect due to the doubled duration/halved healing per turn, while your other defensive skills (Blood Womb, Rot, Putrefying Being) are either single-target or else provide little to no defenses due to giving PDB instead of MPM. I wasn't too big of a fan of enTropy in the first place, though, so take my opinion with a grain of salt. Pretty good based on my limited experience with it. I prefer Dragonlord for defence, but EnTropy has a great balance of defence while doing much more damage than Dragonlord. I might try EnTropy versus the Doom Amulet, I didn't initially do it this way because I imagined that it would be strong to darkness. It's heal isn't amazing, so it might be a bit more difficult. Unimportant trivia: the wings that appear on EnTropy's feet with the skill Rupture are the same ones the Undead Chimera from AQ has.